When National Express changed my itinerary, giving me a 3 hour stopover in Leeds on my way home from Nottingham, they did me a big favour. 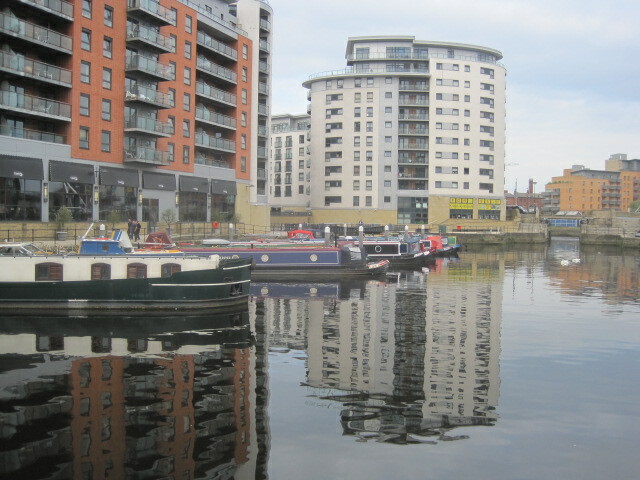 They gave me just enough time to explore Leeds Waterfront. I’d done a tiny bit of research so I knew there was plenty to see. I hope you like looking at canal boats and reflections? There are rather a lot of them here. I grabbed a sandwich as I whistled through the bus station, turned right at the doors, crossed over the road, and there I was, practically on the canal bank. The weather forecast had predicted rain and the coach had passed through some heavy showers, but my luck was in. Starved, because I hadn’t eaten breakfast, I found myself a seat by Clarence Dock and plonked myself down for 10 minutes, to munch and look at these beauties. I don’t know whether you’re familiar with the Royal Armouries museum? It’s the kind of place where you can lose a day quite easily. Have a browse at the website. You might want to make time to come back. No spare time for me that day. I had much exploring to do. A raft of offices, restaurants and apartments surround the dock. I had tried to memorise a route along the towpath but I did what I always do, which is to follow my nose. This usually results in a few false starts and some day I will have to invest in technology so I can summon up the genie in the iPhone. If you look at the Leeds Waterfront map it shows you quite clearly which paths are ‘navigable’. Meantime I blunder on! Isn’t that a lovely name for a bridge? 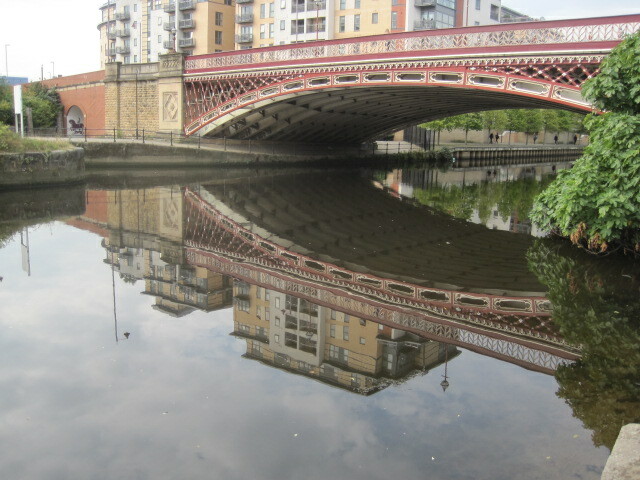 I stayed on the left bank of the River Aire, stopping for a look at Crown Point Bridge. Opened in 1842, this was a toll bridge until 1868. 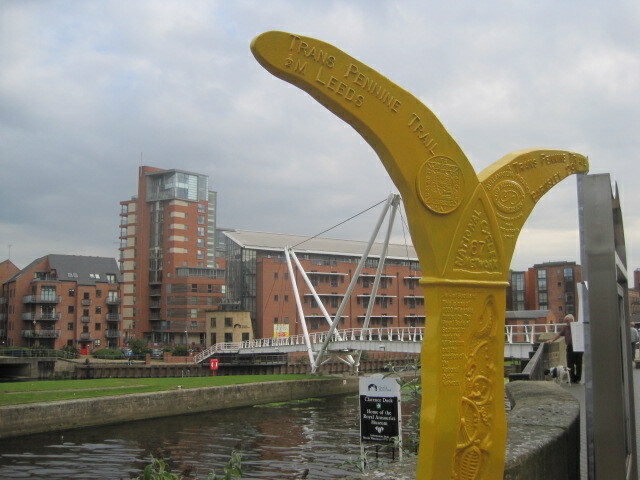 The towpath takes you past Brewery Wharf to Centenary Bridge, built in 1992 to celebrate 100 years of Leeds acquiring city status. The views across to The Calls make this one of the most attractive stretches of the waterfront. At this point the towpath ceases for a short distance and you have to thread your way through Bridge End Apartments, where I found a delightful surprise. The wooden bridge was under repair but, lying in the water beneath, bright jewels clustered on the lily pads. 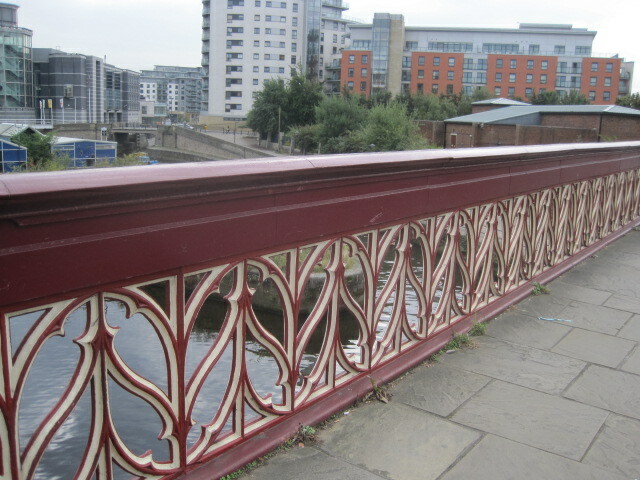 More by luck than skill, I found myself at Leeds Bridge. Dating back to the 14th century, this bridge, originally made from stone, was for 500 years the main crossing point on the river. The medieval bridge was demolished in 1871, when it could no longer cope with the volume of traffic, and the existing cast iron bridge was constructed by 1873. 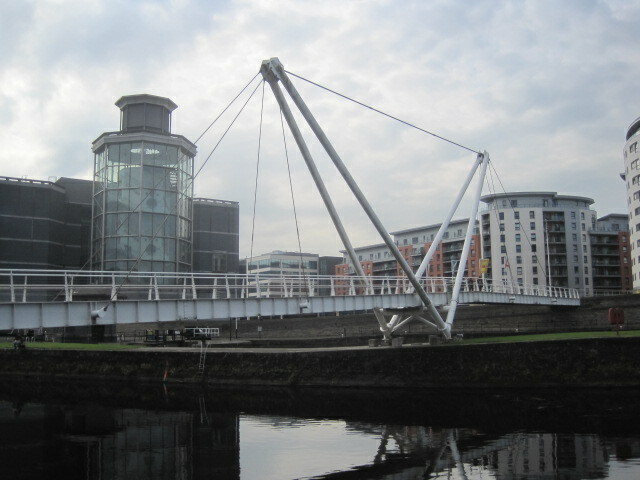 A distinctive looking bridge, it was the setting for the world’s first moving pictures. In 1888, Louis Le Prince filmed horse-drawn traffic on the bridge, showing it in his nearby workplace, which became the world’s first cinema. The crest. Did somebody mention owls? 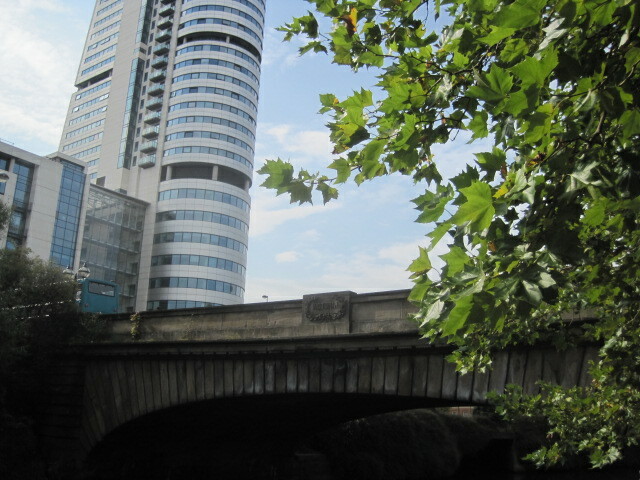 Crossing over Leeds Bridge, the path then hugs the backs of stylish hotels around to Victoria Bridge. The site of a ferry crossing and then a wooden footbridge washed away by floods, the Victoria Bridge was carved from local stone and completed in 1839, soon after the coronation of Queen Victoria. 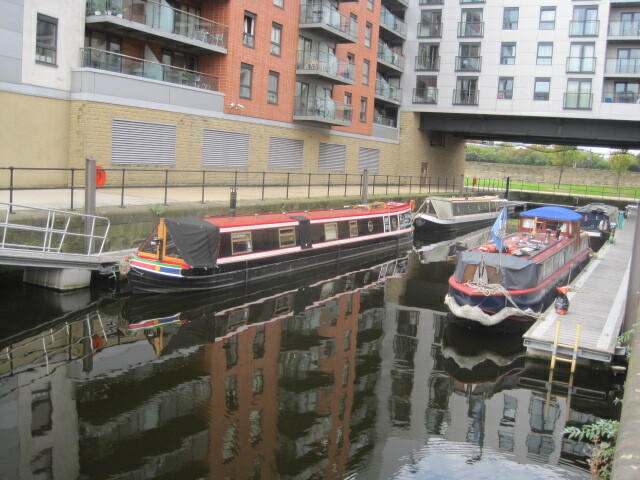 Just beyond this point the River Aire meets the Leeds and Liverpool canal at Granary Wharf, loftily overlooked by the railway. The canal continues out of the city and into the countryside, but I had run out of time to follow it any further. There are 127 miles of the Leeds and Liverpool canal- enough walking even for me! I would have liked to explore Holbeck Urban Village with its iconic Italianate towers, but it was time to turn back. I looped round into Water Lane and headed back up Neville Street, curious to see the light installation under the railway bridge. Passing south of Trinity Church and the impressive looking shopping plaza, I chanced upon the Corn Exchange. Anyone remember Donovan? Apparently he strummed along here before he was famous. A striking mural caught my eye, then I was back at Kirkgate and the Leeds City Market. It’s a regular stop off for me if I’m passing through the city. Both the food stalls and the architecture are unbeatable. A friendly local informed me that I should come along on Halloween, when they open the top gallery for a ‘Spooky walk’. Sounds like fun? Did you ever see a better mural? I hope I haven’t worn you out too much this week, but it’s been interesting, hasn’t it? To join in my Monday walks click on the logo below and it will give you the details. I’ve got the kettle on for what comes next- a visit to some wonderful friends. Please do join me. Staying ‘down under’, Pauline invites us for a beach walk. It reminds me of Christine. Where does the time go? Many thanks to you all for your company and warm support. Happy walking! Hey Jo, could you please make sure the orples don’t drown?